Villa Liberty Montecatini is an elegant villa located in the upper part of Montecatini Terme, in the exclusive "Casina Rossa" area, just 2 km from the railway station. 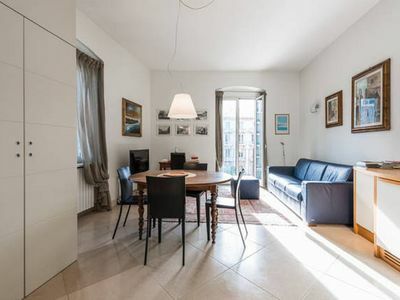 The property is in Liberty-style, a typical style of the early twentieth century, that make Montecatini Terme world famous, and it has been completely and recently restored. The villa is surrounded by a beautiful 3.500 sqm private garden overlooking the hill where stand Montecatini Alto and the Valdinievole valley, with olive and fruit trees, small vegetable garden for first fruits. You will also find a barbecue and a newly-built swimming pool (2015), equipped with chairs and parasols. The property (which can be easily accessed) ensure maximum security thanks to the automatic gate, the video intercom and an alarm system. The villa (about 500 sqm), spread over 4 floors, can accommodate up to 7+3 people as children under the age of 3 years, for a total of 4 bedrooms and 6 bathrooms (4 full and 2 service baths). The ceilings are decorated with original stuccos. The marble floors are frescoed with precious inlays. Developed in every detail, the property has refined high-quality furnishings. Basement floor: The basement floor has vaulted ceilings with terracotta bricks. It consists of a billiard room with an elegant American pool table and a living area equipped with a big ancient fireplace, furnished with armchairs, double sofa bed, large flat TV 55", dining table and chairs. Both the billiard room and the living area have direct access to the garden. 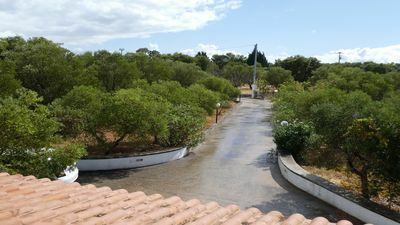 A large service bathroom (without shower nor bathtub) and a comfortable elevator (serving all 4 floors of the villa) make the rest of this floor. Ground Floor: In the large and bright entrance hall, from which you can access to other rooms of the floor, there are some stairs (protected by a small and removable security gate for children) and the elevator. Then you will find a modern and fully equipped kitchen (with American fridge with a double door, InSinkErator food waste disposer, dishwasher, two sinks, multifunction oven, 4 gas burners, electric hot plate, Espresso coffee machine, boiler), pantry and small service bathroom. From the kitchen you can reach the elegant and refined dining room (with table for 6-8 people). 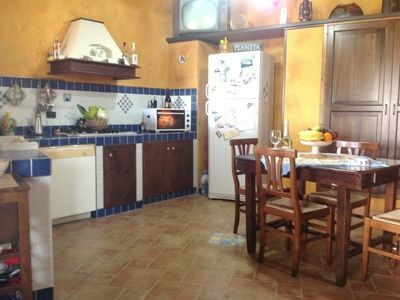 Both the kitchen and the dining room are equipped with mosquito screens. An impressive and bright living room with original decorations and Liberty-style fireplace, air conditioning and sofas (without television) makes the rest of this floor. 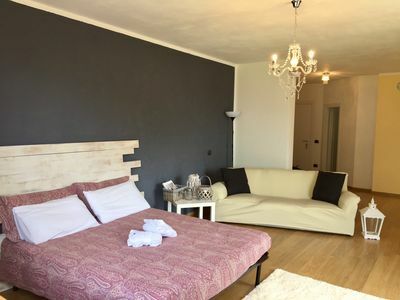 All rooms open onto a large terrace (about 60 sqm), equipped with table and chairs, from which you can enjoy a beautiful view of the hill, Montecatini Alto and the Valdinievole valley. 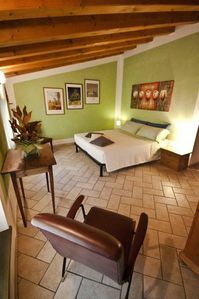 First Floor: Climbing the beautiful (and comfortable) stairs or taking the elevator, you can reach the first floor, where there is the sleeping area with a master bedroom suite of about 65 sqm and a single room with private bathroom. The master bedroom, very spacious and bright, has precious ceilings and oak flooring and is equipped with double bed, ancient fireplace, flat TV 40" and air conditioning. The airy ensuite bathroom (with large bathtub and beautiful shower) is located after a spacious walk-in closet. 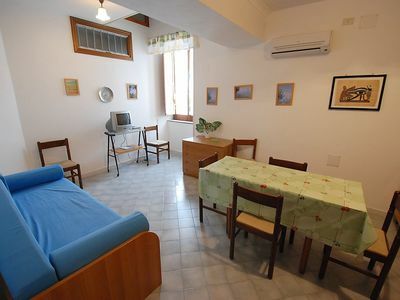 The single room, ideal for a child, is also very bright, has wooden floor and ensuite bathroom with shower. All windows of the first floor are provided with mosquito screens. The top floor of the villa, with its beamed ceilings, is decorated in a more rustic style, differently from the rest of the house. There are sloping ceilings and roof windows with electric opening. 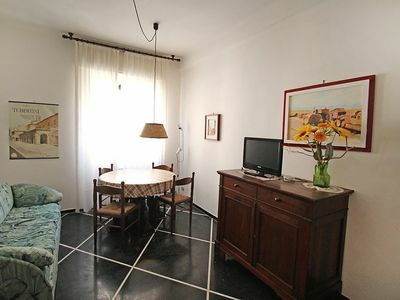 This floor composes of a double bedroom, a laundry (with washing machine and dryer) and a small apartment (ideal for staff or children). The double bedroom (with divisible beds) has air conditioning, flat TV 40", nice ancient wardrobe and ensuite bathroom (with shower and air filter, no windows). 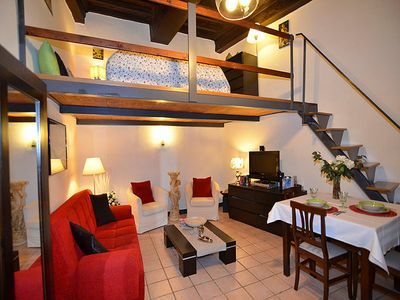 The small apartment (no air conditioning) is a two-roomed apartment consisting of: living room (with a three-quarter size sofa bed), kitchen (with small fridge and stove), small TV and dining table for 2 people, twin room (with joinable beds, window and exposed beams), bathroom (with shower and air filter, no windows). It is provided with floor fan. Included free Wi-Fi (throughout the villa) and air conditioning (in living room and 3 bedrooms only). Some rooms' windows are equipped with mosquito screens. Elegant manor villa with swimming pool, garden and beautiful views of the surrounding countryside, situated in the upper part of Montecatini Terme. The refined atmosphere and the privileged location make it a special and exclusive residence. Excellent combination of ancient and modern, thanks to the very recent renovation, it has the charm and the refinement of Italian style. Equipped with every comfort (elevator, air conditioning, pool table, Internet Wi-Fi), the property ensures maximum security, peace and privacy. 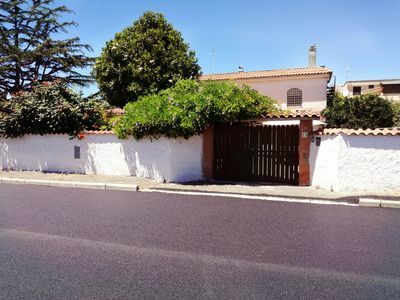 The villa is easily and quickly reachable: it is located about 5 minutes from the motorway exit of Montecatini Terme of the A11 Firenze-Mare and just 100 m from the bus stop, leading both to the train station and Montecatini Alto. Within short walking distance you will find all services (pharmacy, supermarket, newsagent/tobacconist, bar, restaurant). 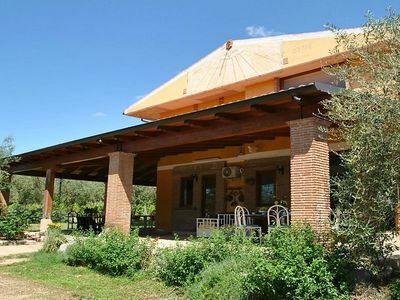 Ideal for families with children or groups of friends who want to visit the beautiful Tuscany. This property has a minimum stay of 7 nights. Included in the price: Park pool and house maintenance; utilities (gas and water); electricity up to 200 kw/h per week; Wi-Fi Internet connection, towels and sheets provided; baby bed, stroller, high chair, baby changing table. Excluded from the price: Final cleaning (300,00 €); heating; electricity more than 200 kw/h per week at 0,40 € per kw/h. Villa Liberty Montecatini is located in Montecatini Terme, just 2 km from the railway station and 1 km from the funicular leading to Montecatini Alto, with its panoramic view and the ruins of its rich history. Montecatini Terme is a renowned spa resort, well-known for its historic Liberty-style villas and for its monumental thermal baths belonging to the Tettuccio complex. 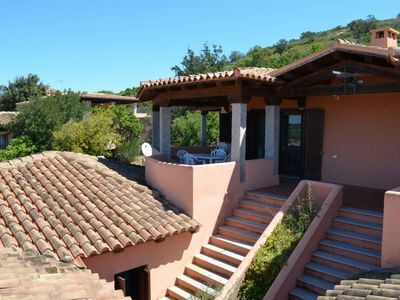 It is the ideal location for a holiday combining relax and well-being with a visit to the main Tuscan cities of art such as Florence, Lucca, Pisa, Siena, but also other beautiful attractions like Vinci (the village of Leonardo), Collodi (the birthplace of Pinocchio), San Gimignano, Volterra and the mountains of Abetone. In Montecatini Terme you will find all you need: shops, restaurants, bars, pharmacies, post offices etc. Moreover Montecatini is situated halfway between Florence and the Versilia coast so you can easily reach the well-known seaside resorts (such as Viareggio or Forte dei Marmi) thanks to the nearby A11 motorway. 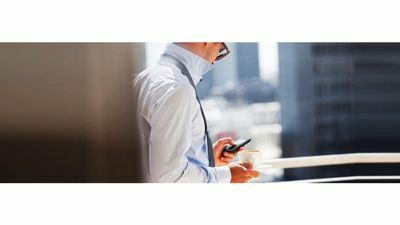 Pistoia (13 km), Lucca (23 km), Pisa (35 km), FLorence (40 km), Viareggio (48 km), Forte dei Marmi (58 km), Abetone (63 km), Siena (78 km). 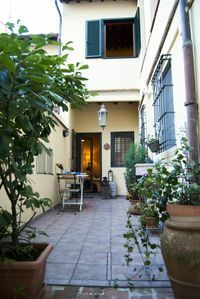 Townhouse with private courtyard in Santa Croce.